Neoliberalism and the Moral Economy of Fraud. David Whyte and Jörg Wiegratz (eds).Routledge. 2016. Is Fraud a Modern Virtue? Corporate fraud has become normalised in modern society – including allegations against Volkswagen, one of the top global brands in motoring, HSBC in global banking and Rolls Royce in aerospace: the list goes on. The rot at the top of the finance industry, a key sector in modern business enterprise, has ceased to abate, even after the 2008 crash. 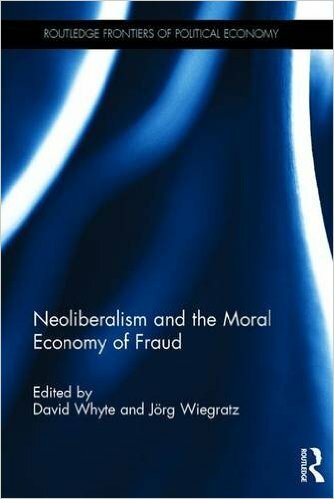 In their latest book, Neoliberalism and the Moral Economy of Fraud, editors David Whyte and Jörg Wiegratz focus on the moral conditions and culture that have enabled fraud to become the new norm in society. In short, the book studies the ‘neo-liberalisation of fraud’. There is ample evidence about the growth and power of multinational corporations, and also the fundamental cracks and weaknesses in both local and global regulation of these profit-oriented enterprises. However, the authors argue that research on the culture of fraud and its justification within neo-liberal government and corporations is scant. Given the thousands of business schools and research faculties all over the world studying business, this gap is highly surprising. If business education has itself been captured by neo-liberal capitalism, then instead of challenging the immorality of fraud, it can become an engine for shaping greed, irresponsibility and corruption. Many are questioning their very purpose and the damage inflicted on the world. This book covers a range of real-world case studies of the moral culture of fraud and also provides deep theoretical insights on how the terminology of fraud has seeped into normality and even conceptions of ‘goodness’. In all, there are seventeen chapters covering a wide variety of themes, all expertly researched and edited. One of the most striking was the study by John Christensen, founder of the pioneering Tax Justice Network, of the morality of tax avoidance, one of the greatest scandals of modernity perpetuated by professional accountants, bankers and lawyers. He interviews accountants working for the Big Four, some of whom argue that it is the duty of business to minimise tax as government is greedy, selfish and inefficient. Yes, professionals licensed to protect the public interest are using their knowledge and skills to perpetuate systemic fraud of state revenues. And they sleep well at night. The entire offshore industry and the trillions of dollars which flow through it have made it a fraud beehive. The finance academy largely avoids looking at it microscopically. There are studies about life insurance frauds in the new South Africa; the tobacco industry and its support for cigarette smuggling; UK supermarkets and the plundering of government subsidies and property rights; criminality in Greece and the Democratic Republic of Congo – all of which show how fraud has become normalised and accepted as a routine method of doing business in the Global North and South. The case studies tell true life stories of how governments, leaders, managers and employees often come to justify their actions in moral terms. In the meantime, billions of people all over the world struggle to feed their families or obtain basic shelter and clothing. The culture of fraud desensitises people and corporations to the wider impacts of their actions, and instead often condones them as the right way to do business. My own recent research on the failure of the UK’s fifth largest bank, HBOS, exposes leadership hubris and greed, where the culture of exploitation had become systemic. It took only eight years for two of Britain’s oldest established and reputed banks – the Royal Bank of Scotland and Halifax – to go bankrupt. The speed of the destruction and the large number of professional and other advisers busy at the feeding trough reveal the reality of the ‘I’ll be gone, You’ll be gone’ mentality that has made fraud so commonplace today. Presently I am working on a new blueprint for Accounting and Finance education which reverses this immoral culture, and puts integrity and a kinder, contented and honest personality at the heart of the future business professional. I have also closely analysed one of the oldest ethical business cultures of the world – the Jains, for the secrets to their endurance and financial sustainability. Presently, there are new rebellions within economics education, including transforming the monetary system to remove rentiers and the lazy rich; and many of these are led by young people very concerned about their future. In parallel, there is a growing vegan movement caring for animals and human health, and a transformation in understandings of holistic living that are shaping a counterculture against neo-liberal fraud. Whtye and Wiegratz’s book plays a very important role in increasing our understanding of unethical behaviour, which is far beyond the rogue trader or the lone wolf but has instead become central to the science and character of modern big business. All the articles are very insightful and beautifully written, though the proofreading is sadly poor. The book introduces the reader to radical literatures questioning the depth of neo-liberal hubris in the agenda and actions of modern institutions, including regulators. Just as we fight our local causes, it reminds us to understand the larger forces which shape our language, systems, education and public services – fraud is an ideology that has become a cancer in modernity. To escape it, we must address its corrupt beliefs, stories, customs and rituals. Otherwise, we will stay on an island firefighting or perpetuating fraudulent culture. Dr Atul K. Shah is a Senior Lecturer at the Suffolk Business School.